, an amiable and ingenious writer, was a native of Ireland, where he was born in the year 1706. His father, the rev. William Brooke of Rantavan, rector of the parishes of Killinkare, Mullough, Mybullough, and Licowie, is said to have been a man of grent talents and | worth; his mother’s name was Digby. His education appears to have been precipitated in a manner not very usual: after being for some time the pupil of Dr. Sheridan, he was sent to Trinity college, Dublin, and from thence removed, when only seventeen years old, to study law in the Temple. Dr. Sheridan was probably the means of his being introduced in London to Swift and Pope, who regarded him as a young man of very promising talents. How long he remained in London we are not told*, but on his return to Ireland he practised for some time as a chamber counsel, when an incident occurred which interrupted his more regular pursuits, and prematurely involved him in the cares of a family. An aunt, who died at Westmgath about the time of his arrival in Ireland, committed to him the guardianship of her daughter, a lively and beautiful girl between eleven and twelve years old. Brooke, pleased with the trust, conducted her to Dublin, and placed her at a boarding-school, where, during his frequent visits, he gradually changed the guardian for the lover, and at length prevailed on her to consent to a private marriage. In the life prefixed to his works, this is said to have taken place before she had reached her fourteenth year: another account, which it is neither easy nor pleasant to believe, informs us that she was a mother before she had completed that year. When the marriage was discovered, the ceremony was again performed in the presence of his family. For some time this happy pair had no cares but to please each other, and it was not until after the birth of their third child that Brooke could be induced to think seriously how such a family was to be provided for. The law had long been given up, and he had little inclination to resume a profession which excluded so many of the pleasures of imagination, and appeared inconsistent with the feelings of a mind tender, benevolent, and somewhat romantic. Another journey to London, however, promised the advantages of literary society, and the execution of literary schemes by which he might indulge his genius, and be rewarded by fame and wealth. Accordingly, soon after his arrival, he renewed his acquaintance with his former friends, and published his philosophical poem, entitled “Universal Beauty.” This had been submitted to Pope, who, probably, contributed his assistance, and whose manner at least is certainly followed. At what time this occurred is uncertain. The second part was published in | 1735, and the remainder about a year after. What fame or advantage he derived from it we know not, as no mention is made of him in the extensive correspondence of Pope or Swift. 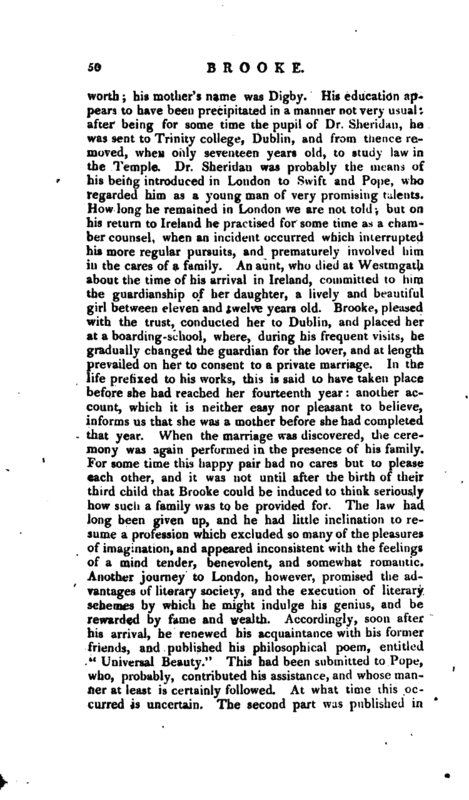 He was, however, obliged to return to Ireland, where for a short time he resumed his legal profession. In 1737 he went a third time to London, where he was introduced to Lyttelton and others, the political and literary adherents of the prince of Wales, “who,” it is said, “caressed him with uncommon familiarity, and presented him with many elegant and valuable tokens of his friendship.” Amidst such society, he had every thing to point his ambition to fame and independence, and readily caught that fervour of patriotic enthusiasm which was the bond of union and the ground of hope in the prince’s court. In 1738 he published a translation of the First Three Books of Tasso, of which it is sufficient praise that Hoole says: “It is at once so harmonious and so spirited, that I think an entire translation of Tasso by him would not only have rendered my task unnecessary, but have discouraged those from the attempt whose poetical abilities are much superior to mine.” He was, however, diverted from completing his translation, by his political friends, who, among other plans of hostility against the minister of the day, endeavoured to turn all the weapons of literature against him, Their prose writers were numerous, but principally essayists and pamphleteers: from their poets they had greater expectations; Paul Whitehead wrote satires; Fielding, comedies and farces; Glover, an epic poem; and now Brooke was encouraged to introduce Walpole in a tragedy. This was entitled “Gustavus Vasa, the deliverer of his country,” and was accepted by Drury-lane theatre, and almost quite ready for performance, when an order came from the lord chamberlain to prohibit it. 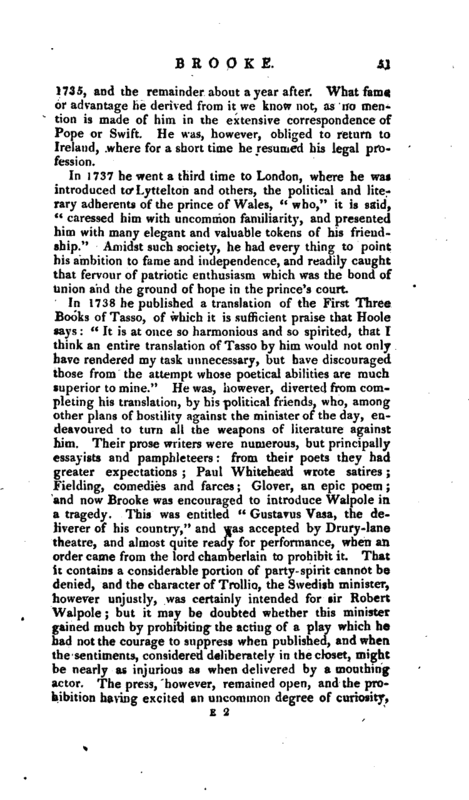 That it contains a considerable portion of party-spirit cannot be denied, and the character of Trollio, the Swedish minister, however unjustly, was certainly intended for sir Robert Walpole; but it may be doubted whether this minister gained much by prohibiting the acting of a play which he had not the courage to suppress when published, and when the sentiments, considered deliberately in the closet, might be nearly as injurious as when delivered by a mouthing actor. The press, however, remained open, and the prohibition having excited an uncommon degree of curiosity, | the author was more richly rewarded than he could been by the profits of the stage. Above a thousand copies were subscribed for at five shillings each, and by the sale of the subsequent editions, the author is said to have cleared nearly a thousand pounds. 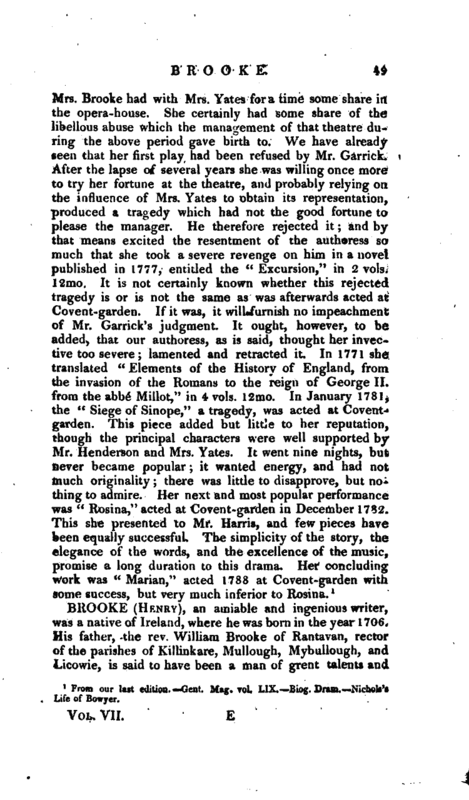 The editor of the Biographia Dramatica says that it was acted in 1742, with some alterations, on the Irish stage, by the title of “The Patriot.” Dr, Johnson, who at this time ranked among the discontented, wrote a very ingenious satirical pamphlet in favour of the author, entitled “A complete vindication of the Licensers of the Stage from the malicious and scandalous aspersions of Mr. Brooke, author of GustavusVasa,” 1739, 4to. 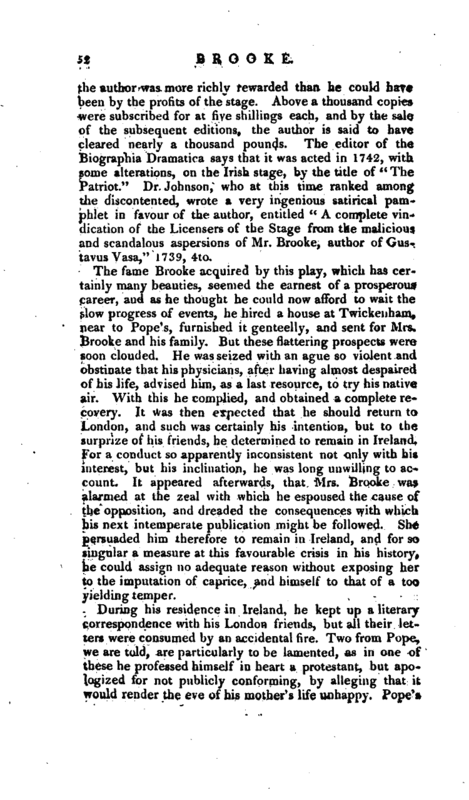 The fame Brooke acquired by this play, which has certainly many beauties, seemed the earnest of a prosperous career, and as he thought he could now afford to wait the slow progress of events, he hired a house at Twickenham, near to Pope’s, furnished it genteelly, and sent for Mrs. Brooke and his family. But these flattering prospects were soon clouded. He was seized with an ague so violent and obstinate that his physicians, after having almost despaired of his life, advised him, as a last resource, to try his native arr. With this he complied, and obtained a complete recovery. It was then expected that he should return to London, and such was certainly his intention, but to the surprize of his friends, he determined to remain in Ireland. For a conduct so apparently inconsistent not only with his interest, but his inclination, he was long unwilling to account. It appeared afterwards, that Mrs. Brooke was alarmed at the zeal with which he espoused the cause of the opposition, and dreaded the consequences with which his next intemperate publication might be followed. She persuaded him therefore to remain in Ireland, and for so singular a measure at this favourable crisis in his history, he could assign no adequate reason without exposing her to the imputation of caprice, and himself to that of a too yielding temper. During his residence in Ireland, he kept up a literary correspondence with his London friends, but all their letters were consumed by an accidental fire. Two from Pope, we are told, are particularly to be lamented, as in one of these he professed himself in heart a protestant, but apologized for not publicly conforming, by alleging that it would render the eve of his mother’s life unhappy. 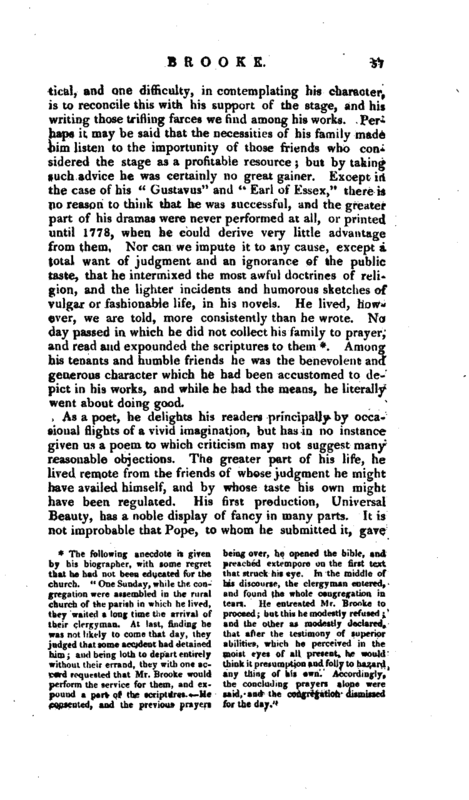 Pope’s | filial affection is the most amiable feature in his character; but this story of his declining to conform because it would give uneasiness to his mother, falls to the ground when, the reader is told that his mother had been dead six: or seven years before Brooke went to Ireland. 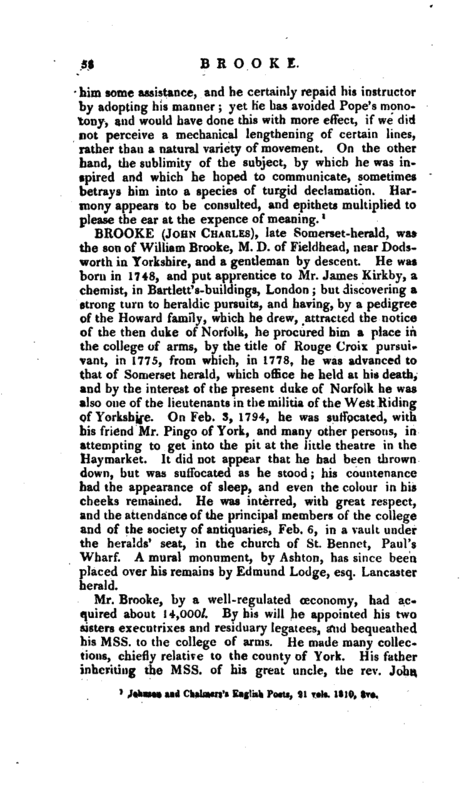 In another letter, he is said, with more appearance of truth, to have advised Brooke to take orders, “as being a profession better suited to his principles, his disposition, and his genius, than that of the law, and also less injurious to his health.” Why he did not comply with this advice cannot now be known; but, before this time, he appears to have been of a religious turn, although it is not easy to reconcile his principles, which were those of the strictest kind, with his continual ambition to shine as a dramatic writer. For some years after his arrival in Ireland, little is known of his life, except that lord Chesterfield, when viceroy, conferred upon him the office of barrack-master. His pen, however, was not idle. 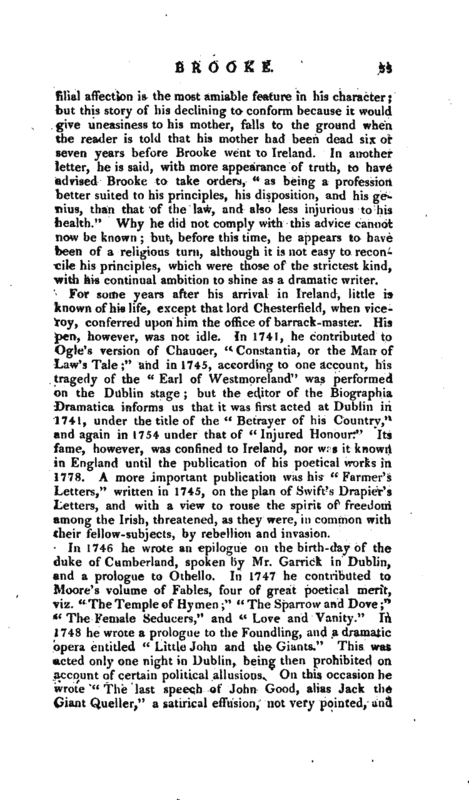 In 1741, he contributed to Ogle’s version of Chaucer, “Constantia, or the Man of Law’s Tale;” and in 1745, according to one account, his tragedy of the “Earl of Westmoreland” was performed on the Dublin stage; but the editor of the Biographia Dramatica informs us that it was first acted at Dublin in 1741, under the title of the “Betrayer of his Country,” and again in 1754 under that of “Injured Honour.” Its fame, however, was confined to Ireland, nor was it known in England until the publication of his poetical works in 1778. A more important publication was his “Farmer’s Letters,” written in 1745, on the plan of Swift’s D rapier’s Letters, and with a view to rouse the spirit of freedom among the Irish, threatened, as they were, in common with their fellow-subjects, by rebellion and invasion. These were “The Contending Brothers,” the “Female Officer,” and the “Marriage Contract,” comedies “The Impostor,” a tragedy, and “Cymbeline,” an injudicious alteration from Sbakspeare. “Montezuma,” a tragedy, is printed among his works, but is said to have been the production of another hand. Of these, the “Female Officer” only is said to have been once acted, when Mrs. Woffington personated the officer, probably at her benefit. In 1762, he published a pamphlet entitled “The Trial of the Roman Catholics,” the object of which was to remove the political restraints on that class, and to prove that this may be done with safety. In this attempt, however, his zeal led him so far as to question incontrovertible facts, and even to assert that the history of the Irish massacre in 1641 is nothing but an old wives fable; and upon the whole he leans more to the principles of the Roman catholic religion, than an argument professedly political, or a mere question of extended toleration, seemed to require. His next work excited more attention in England. 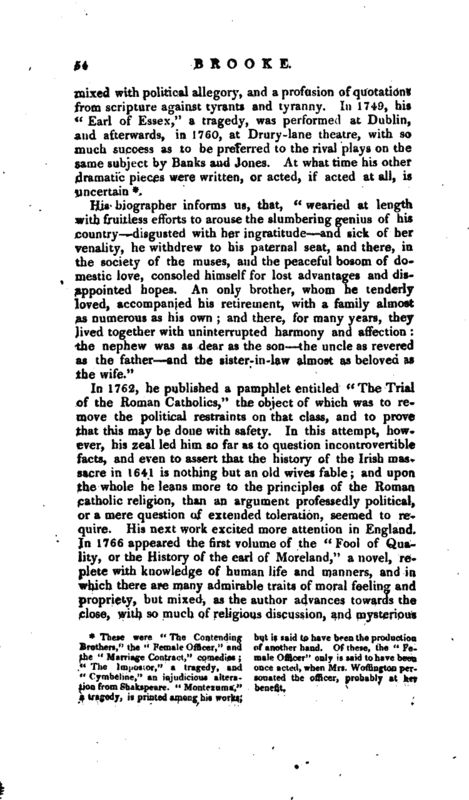 In 1766 appeared the first volume of the “Fool of Quality, or the History of the earl of Moreland,” a novel, replete with knowledge of human life and manners, and in which there are many admirable traits of moral feeling and propriety, but mixed, as the author advances towards the close, with so much of religious discussion, and mysterious | stories and opinions, as to leave it doubtful whether he inclined most to Behmenism or popery. It became, however, when completed in five volumes, 1770, a very popular novel, and has often been reprinted since. In 1772, he published “Redemption,” a poem, in which that great mystery of our religion is explained and amplified by bolder figures than are usually hazarded. His taste was indeed evidently on the decline, and in this as well as all his later performances, he seems to have yielded to the enthusiasm of the moment, without any reserve in favour of his better judgment. In this poem, too, heappears to have lost his pronunciation of the English so far as to introduce rhymes which must be read according to the vulgar Irish. His last work was “Juliet Grenville,” a novel in three volumes, which appeared in 1774. This is very justly entitled “The History of the Human Heart,” the secret movements of which few novelists have better understood; but there is such a mixture of the most sacred doctrines of religion with the common incidents and chitchat of the modern romance, that his best friends could with difficulty discover among these ruins, some fragments which indicated what his genius had once been. In this year (1774) we are told, that Garrick pressed him earnestly to write for the stage, and offered to enter into articles with him at the rate of a shilling per line for all he should write during life, provided that he wrote for him alone. 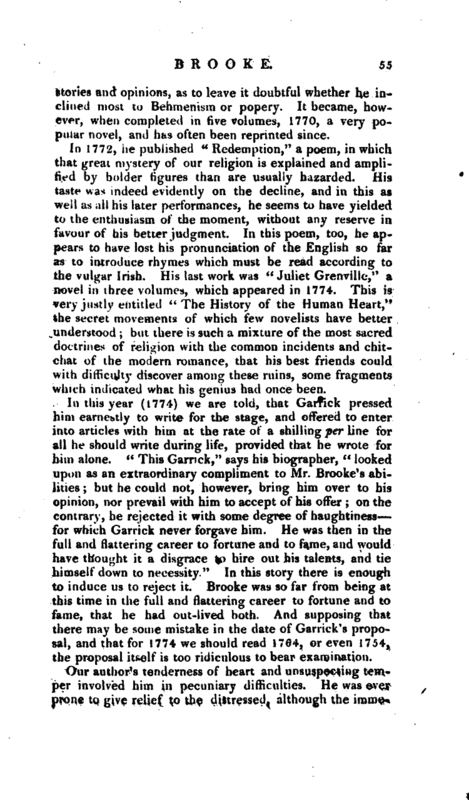 “This Garnck,” says his biographer, “looked upon as an extraordinary compliment to Mr, Brooke’s abilities; but he could not, however, bring him over to his opinion, nor prevail with him to accept of his offer; on the contrary, he rejected it with some degree of haughtiness for which Garrick never forgave him. He was then in the full and Haltering career to fortune and to fame, and would have thought it a disgrace to hire out his talents, and tie himself down to necessity.” In this story there is enough to induce us to reject it. Brooke was so far from being at this time in the full and flattering career to fortune and to fame, that he had out-lived both. And supposing that there may be some mistake in the date of Garrick’s, proposal, and that for 1774 we should read 1764, or even 1754, the proposal itself is too ridiculous to bear examination. He was in possession of the place of barrack-master of Mullingar, at his death. leaving a son, since dead, and a daughter, the child of his old age. His poetical works were collected in 1778, in four volumes octavo, printed very incorrectly, and with the addition of some pieces which were not his. In 1792 another edition was published at Dublin, by his daughter, who procured some memoirs of her father prefixed to the first volume. In this she informs us she found many difficulties. He had lived to so advanced an age, that most of his contemporaries departed before him, and this young lady remembered nothing of him previous to his retirement from the world. Such an apology cannot be refused, while we must yet regret that miss Brooke was not able to collect information more to be depended on, and arranged with more attention to dates. The narrative, as we find it, is confused and contradictory. 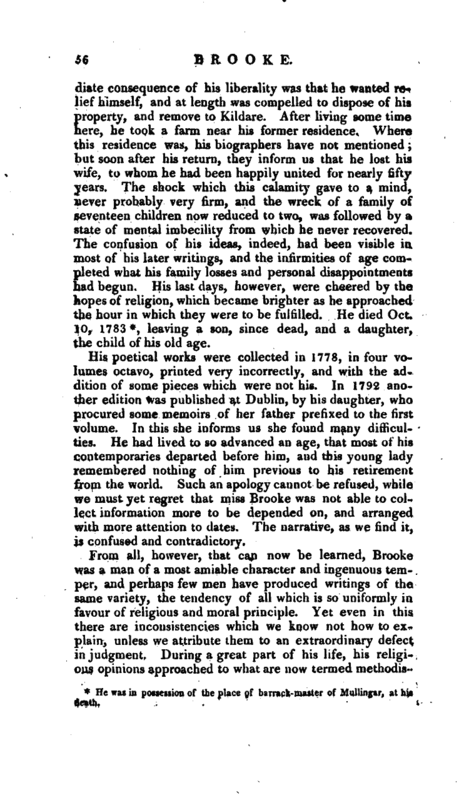 From all, however, that can now be learned, Brooke was a man of a most amiable character and ingenuous temper, and perhaps few men have produced writings of the same variety, the tendency of all which is so uniformly in favour of religious and moral principle. Yet even in this there are inconsistencies which we know not how to explain, unless we attribute them to an extraordinary defect in judgment. During a great part of his life, his religious opinions approached to what are now termed | methodistical, and one difficulty, in contemplating his character, is to reconcile this with his support of the stage, and his writing those trifling farces we find among his works. Perhaps it may be said that the necessities of his family made him listen to the importunity of those friends who considered the stage as a profitable resource; but by taking such advice he was certainly no great gainer. Except in the case of his “Gustavus” and “Earl of Essex,” there is no reason to think that he was successful, and the greater part of his dramas were never performed at all, or printed until 1778, when he could derive very little advantage from them. Nor can we impute it to any cause, except a total want of judgment and an ignorance of the public taste, that he intermixed the most awful doctrines of religion, and the lighter incidents and humorous sketches of vulgar or fashionable life, in his novels. He lived, however, we are told, more consistently than he wrote. No day passed in which he did not collect his family to prayer, and read and expounded the scriptures to them *: Among his tenants and humble friends he was the benevolent and generous character which he had been accustomed to depict in his works, and while he had the means, he literally went about doing good. 1 Johnson and Chalmers’s English Poets, 21 vols. 1810, 8vo.